EdAlive COMPLETE! All 51 Amazing Titles in One! At EdAlive we know that kids learn through fun! 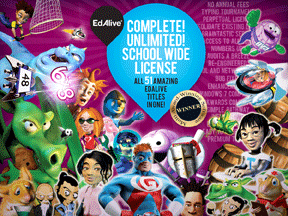 That's why all EdAlive titles are rich in activities that motivate kids through fun. At the same time the educational activities within our products are of the highest quality and are directly based on the relevant curricula. Children, as individuals, have different learning needs. The challenge has always been to deliver the right educational content at the right time for the right child and then to motivate them to access it. 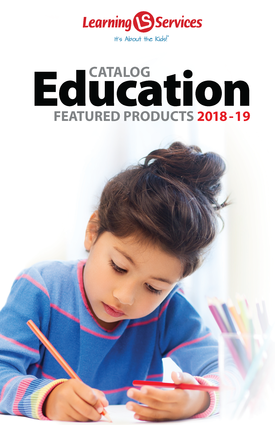 The EdAlive product range has grown from this conviction and treats each child as an individual with unique user profiles, advanced record keeping and high levels of customization allowing each child to work at their own pace and to know the reward of success. 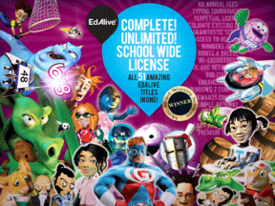 EdAlive COMPLETE: – All on one USB stick containing 51 titles for Windows and Mac!– Supports both Network and Stand-Alone systems – Award-winning software aligned with USA standards!– Flexible content, customizable to meet each child’s unique needs!– Builds Math, Reading, Literacy & Typing Skills! OS X 10 or higher, includes OS 10.7, 10.8 & 10.9, except for Upgront, wich is compatible up to 10.6.8 only.